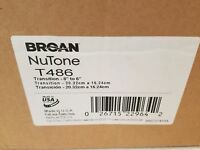 Broan Duct Collar 4 "
New, as described and speedy shipping. Vent above stove had an old Nautilus fan that no longer worked. It was the same housing as this fan. All I had to do was replace motor and impeller and we now have a working fan again! Easy to install almost a year no problem. Great product, the motor is powerful and quiet.